My rating: 4.5 / 5 !!! What is with Maas and all the feels she likes torturing her readers with?!? 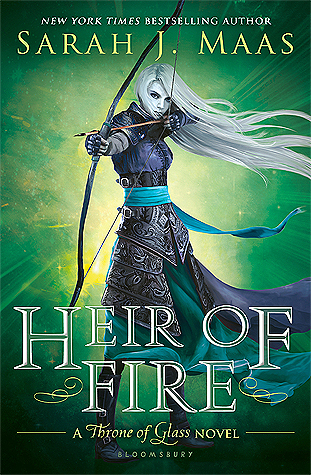 Heir of Fire is an amazing third book in the ToG series. I devoured it in two days! Initially, I wondered why some events were told from Manon's perspective (one of the many evil witches) but like everything else in this series there's always some sort of connection. I won't lie and say that I loved all the characters, despite Manon's slowly thawing heart, she is still a complete wretch. I appreciate that the witches bring their children up to be full of hate and brutality and it's not their fault but I despised them all regardless. "Do you still love her?" He didn't know why it was important. Chaol closed his eyes for a moment. "A part of me will always love her. But I had to get her out of this castle. Because it was too dangerous, and she was...what she was becoming..."
"She was not becoming anything different from what she always was and always had the capacity to be. You just finally saw everything. And once you saw that other part of her..." Dorian said quietly. It had taken him until now, until Sorscha, to understand what that meant. "You cannot pick and choose what parts of her to love." I thought Dorian was a leeetle spoiled in the last book but he's outdone himself this time round. I loved him sooo much! He finally managed to semi get over Celaena and is working on his magic, which I admired about him. Celaena is badass as ever so there's not much to add apart from that she's the most brilliant female character I've read about (coming very close to Emma from Cassy Clare's Lady Midnight). Her heartbreak and struggles were so emotional and I loved how Maas made it all so realistic, and there were times I almost cried. Almost. It had been ten years-ten long years since she had heard her mother's voice. But she heard it then over the force of her weeping, as clear as if she knelt beside her. Fireheart-why do you cry? "Because I am lost," she whispered onto the earth. "And I do not know the way." It was what she had never been able to tell Nehemia-that for ten years, she had been unsure how to find the way home, because there was no home left. Finally, a new favourite of mine is Rowan. **Sigh** It's clear that presently there's no romance between him and Aelin but their connection is Mindblowing. I thought She could only have such chemistry with Chaol but Rowan might be a stronger contender. Especially since Rowan is fae, so doesn't have that much human emotion to pity her, which is just what she needed. I love him and think he's so awesome so Maas please don't kill him in the next book!!! "I don't know what you want from Maeve-what answers you're looking for, but you-"
"You don't know what I want from her?" It was more of a shout than a question. "How about saving the world from the King of Adarlan?" "Why bother? Maybe the world's not worth saving." She knew he meant it, too. Those lifeless eyes spoke volumes. He looked at his friend, perhaps for the last time, and said what he had always known, from the moment they'd met, when he'd understood that the prince was his brother in soul. "I love you."